It's 05:04 in Sandy Creek, USA right now. 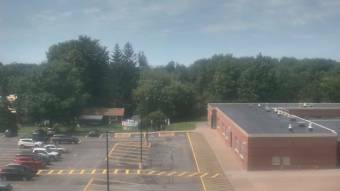 Sandy Creek School A webcam in Sandy Creek, New York - camera location: Sandy Creek School. Altmar, New York: Lorton Lake Back End, West View, 10.2 miles away. Camden, New York: City View, 27.3 miles away. Fairmount, New York: Fairmount Hills, 41.9 miles away. Manlius, New York: Fayetteville Manlius High School, 44.7 miles away. Port Byron, New York: Port Byron Central School, 50 miles away. Sodus Point, New York: Sodus Bay Lighthouse & Museum, 52.1 miles away. Palmyra, New York: Yellow Mills Road, 70.2 miles away. Webster, New York: Forest Lawn Beach on Lake Ontario, 73.7 miles away.